Treat damaged, dehydrated hair to the nourishing and replenishing properties of ikoo Infusions Thermal Treatment Hair Wrap Hydrate and Shine Mask, a thermal hair wrap encriched with deeply hydrating ingredients. 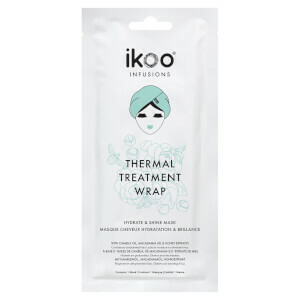 Caring for damaged hair and helping to protect against future breakage, the thermal treatment wrap develops a pleasant heat for a sensual experience, and provides intensive care for dehydrated, dull and frizzy tresses. Its blend of Camelia Oil, Macadamia Oil and Honey extracts condition and nourish to lock in moisture and eliminate frizz. 1. Rinse hair and dry slightly. 2. Slip the wrap over the head and fix with the sticker. 3. Depending on hair type, leave on for 15-25 minutes and massage frequently. 4. Thoroughly rinse. For optimum results, use at least 2-3 times a month. Water, Cetearyl Alcohol, Behentrimonium Chloride, Triethylhexanoin, Dipropylene Glycol, Stearamidopropyl Dimethylamine, Coco-Caprylate/Caprate, Isopropyl Alcohol, Dicaprylyl Carbonate, Oleth-5, Polyquaternium-10, Polyquaternium-11, Microcrystalline Wax, Vegetable Oil, Caprylyl Glycol, Citric Acid, Camellia Japonica Seed Oil, Macadamia Ternifolia Seed Oil, Butylene Glycol, Disodium EDTA, Lauroyl Lysine, Sodium Chloride, Argania Spinosa Kernel Oil, Phenoxyethanol, Tocopherol, 1,2-Hexanediol, Honey Extract, Ethylhexylglycerin, Lonicera Japonica (Honeysuckle) Flower Extract, Bellis Perennis (Daisy) Flower Extract, Anthemis Nobilis Flower extract, Propolis Extract, Paeonia Albiflora Flower Extract, Magnolia Liliflora Flower Extract, Ipomoea Purpurea Extract, Sambucus Nigra Flower Extract, Achillea Millefolium Flower Extract, Citrus Aurantium Dulcis (Orange) Flower Extract, Jasminum Officinale (Jasmine) Flower Extract, Solanum Lycopersicum (Tomato) Fruit Extract, Propylene Glycol, Camellia Japonica Leaf Extract, Diospyros Kaki Fruit Extract, Ceratonia Siliqua (Carob) Fruit Extract, FragranceSiliqua (Carob) Fruit Extract, Fragrance.